The Raj Program for Stress and Anxiety, based on the science of Maharishi Ayurveda, provides a comprehensive and natural approach to stress reduction. Stress can affect all aspects of life, including our emotions, behavior, thinking ability, and physical health. Stress is known to be a contributing factor in a countless variety of chronic disorders, yet its influence can be easily overlooked. From an Ayurvedic perspective, both the mind and body must be in balance to experience optimal health. Anything that upsets that balance creates a disruption our normal functioning. Along with powerful Ayurvedic rejuvenation and detoxification therapies to remove the damaging effects of stress, The Raj offers yoga and breathing exercises, as well as optional mediation classes, as effective stress reduction tools. The multi-modality Ayurvedic approach to stress reduction can help you regain creativity, dynamism, clarity and efficiency, along with emotional stability and increased effectiveness in daily life. Our Ayurveda experts will design a customized program for your stress and anxiety condition, including specialized recommendations to continue at home. Ayurvedic experts, Mark Toomey PhD and Vaidya MP Manohar, work in conjunction with Dr. Robert Schneider, MD, to create an effective, customized program to address your condition. Using Ayurveda Pulse Assessment, our team will create an individualized treatment program that can help relieve your experience of stress and anxiety, naturally and holistically. With an emphasis on prevention, and utilizing only natural approaches, The Raj multi-modality program for Stress removes toxins, nourishes the brain, and promotes balanced health. What is The Raj’s Ayurvedic approach to stress? In Ayurvedic terms, stress is related to the balance: balance in one of the three vital energies, or “doshas” (Vata, Pitta and Kapha), balance in how we live our lives, balance in what and how we eat and digest our food, balance in our emotions, balance in how we think and act. According to Ayurveda, both the mind and body must be in balance to achieve optimal health. Therefore, anything that upsets that optimal balance contributes to ill health. At the heart the programs at The Raj are the powerful Ayurvedic rejuvenation and detoxification therapies, called Panchakarma. 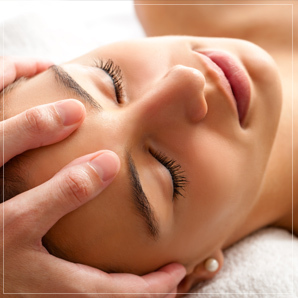 These luxurious, transforming treatments help remove stress and impurities, restoring balance to the physiology. Each day you’ll spend soothing hours in a variety of treatments, including herbalized oil massage, cleansing steam baths and gentle purification procedures. Our professional and caring staff will guide you through every step, while you simply relax and enjoy. As balance is restored, guests experience a more energetic physiology, a clearer mind and growing inner happiness. The Raj offers additional tools of yoga, optional mediation classes and breathing exercises (pranayama) to help support and maintain balance on all levels of life. Stress and Anxiety can lead to chronic diseases such as heart disease, stroke, immune disorders, and even cancer. Stress can also negatively affect judgment, decision-making, alertness, creativity, and emotional balance. Chronic stress has been known to cause increased conflict and aggression. In just a few days at The Raj Ayurveda Health Spa, gain deep rest and relaxation, recover from stress and anxiety, rejuvenate, and learn natural effective stress management techniques for your day-to-day life. What are symptoms of stress disorder or burnout? Can Yoga help with stress relief? In addition to rejuvenating Panchakarma treatments, The Raj offers additional stress-busting tools of yoga, and breathing exercises (pranayama) to help support and maintain balanced health. Modern medical research supports this ancient prescription of yoga and breathing exercises. The yoga and breathing exercises increase serotonin and endorphins, neurotransmitters that are well known to improve mood. They are also found to increase circulation to the brain and to produce hormones that are beneficial to mental health. Practicing yoga and breathing exercises also act as a preparation for a deeper experience during meditation, promoting balance in mental and emotional functioning and supporting increased physical well-being. Is meditation a part of your program for stress relief? We recommend that you learn the Transcendental Meditation® (TM®) technique as an adjunct to your stress relief program at the Raj. TM is a simple, effortless technique that produces profound benefits indicative of both mental and physiological balance. It has been shown to be an effective tool for reducing chronic anxiety and overall stress. In fact, the (TM®) technique was found to be twice as effective as other techniques for stress and anxiety, according to a Stanford University study. The study was a meta-analysis of 146 independent studies, and was published in the Journal of Clinical Psychology. Instruction in TM can easily be added to any in-resident treatment package. Please note that classes are not included in the in-residence package price. I came to The Raj stressed and imbalanced. After 5 days of treatments, I left calm, and relaxed, with more positivity and energy. A transformation like this rarely occurs in 5 days. No more pains in stomach, headaches, tension and noise in my head. Feel much more relaxed mentally & physically. When I came to The Raj, I had many years of accumulated stress, constant headaches, pains in my joints, and I had become completely exhausted. After completing my Panchakarma treatments I feel wonderful and refreshed. I have no pain, no headaches, and I have renewed energy. This has been a truly wonderful, thoroughly beneficial experience. Life changing. When I came to The Raj, my anxiety and stress levels had really increased. Following the specialized treatments, the nourishing and delicious meals, and much needed quiet time, I feel more refreshed and calmer. My mind is more quiet and settled, with a decrease in the urgent and obsessive thinking, and less “tic” movements.